The following article was severely delayed due to corruption of the associated video files. At the time of this writing, the video of game 2 has still not been recovered; we apologize for this delay. June 6th, 2015. This year's fortieth annual Origins Game Fair was also the third Cardfight!! 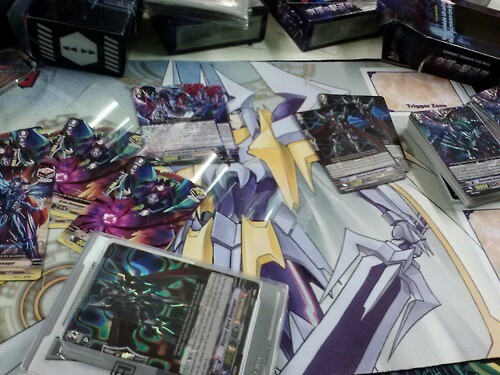 Vanguard tournament organized by Bushiroad USA at the Fair, with 49 cardfighters participating in the competition. Cardfight Pro's editor-in-chief of four years, Alexander "Touya" Fisher, took first place with a Phantom Blaster “Abyss” deck. Unlike Bushiroad's ongoing Spring Festival tournaments, the Origins event was held in a best-of-three modified Swiss format. Double elimination rules were implemented so that only cardfighters who maintained a record of X-1 or better would be able to keep playing until the last round. Second place went to an Oracle Think Tank cardfighter playing Susanoo with Sakuya, third place to a Narukami fighter playing Sweep Command Dragon, and fourth place to a Dimension Police fighter playing Sin Buster with Daikaiser. Top 8 at the tournament included two Thavas-Glory Maelstrom fighters and one Cat Butler; the eighth cardfighter was not reported. The tournament finals were recorded on video and are provided below. 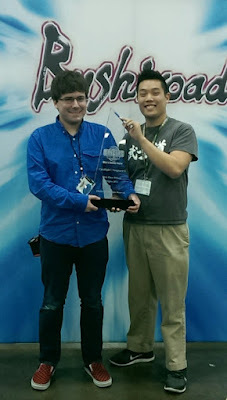 Bushiroad USA sales manager Johnathan Lee (pictured above at right) attended the tournament as its organizer, with the assistance of local Ohio card shop The Soldiery. We were able to briefly ask Mr. Lee a few questions while on-site. According to Lee, the decision to use best-of-three at the Origins Fair was influenced by its popularity over best-of-one. A survey conducted by Bushiroad of over two thousand cardfighters showed a majority preference for best-of-three. The decision was also influenced by the Origins event not being incorporated into the world championship series or Team League 2015, as this gave the US branch greater creative freedom with running the tournament. However, when asked if the format used at Origins would be integrated into the 2015 world championships, Lee could not definitively answer in the affirmative. Doing so would require approval from Bushiroad of Japan, which has been running best-of-one tournaments for all of its card games since 2008. By the time the finals began, it was the fourth set that the two finalists would play with one another. In the minor tournament on the previous day they had fought during round 5 of Swiss, in top 8 of that same competition, and in round 4 of the June 6th tournament. Each player was thus familiar with the other's deck composition. Game 1 of the finals ended quickly, primarily due to trigger checks. 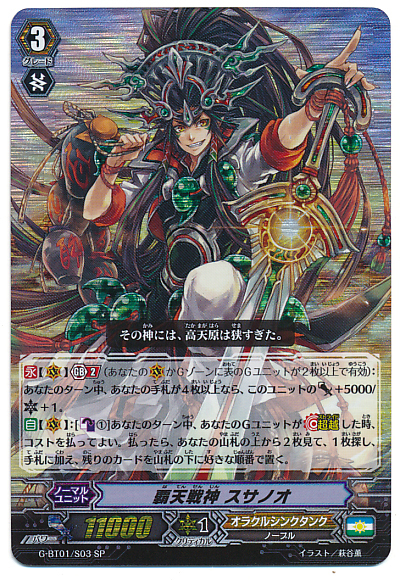 Touya checked critical triggers on his first two turns of the fight, putting his opponent at 5 damage, and on reaching grade 3 he legioned immediately to end the fight. The game left both the finalists and the spectators grateful that they were playing a best-of-three set; Touya remarked after the finals were over that had this game determined the overall winner, no one would have accepted him as the champion. His opponent remained calm in face of the poor opening to the set, stoically carrying on with game 2. Game 2 has been lost due to the video file being corrupted, and we are attempting to recover it. One of the critical weaknesses of the “Abyss” deck was demonstrated during the game, as Touya was forced to sit on Mordred Phantom for the entire duration due to not drawing “Abyss.” Because the deck hinges around the abilities of a single card, failing to draw it negated the primary threat of the deck, and without Branwen in the format his stride options were limited entirely to additional copies of Mordred. Meanwhile Oracle Think Tank shined in this game; the reliable draw options and the constant threat of Silent Tom kept his opponent continually ahead. Although the game went long, it ended with all four copies of Phantom Blaster “Abyss” still remaining in the deck. In game 3 Touya capitalized on early guard opportunities versus his opponent's unboosted center lane to avoid having to block Silent Tom while at high damage later on. As the fight progressed he stayed very close in card advantage despite facing draw skills that should have changed the tempo of the fight immensely. His opponent blocking Judgebau took a perfect defense card out of their hand early on, which led to the decisive blow for the fight at around the 04:40 mark. The threat of “Abyss'” high-power second attack forced his opponent to put down 20000 shield in four parts, as 5000 shield guardians. That net -4 kept them from taking the lead in cards controlled despite using both Susanoo's and Takemikazuchi's draw skills to catch up. Dry trigger checks throughout the fight left the Oracle Think Tank cardfighter at a severe disadvantage, while Touya was able to better dictate the pace of their game with “Abyss'” self-standing skill. While his opponent seemingly had an opportunity to stave off that offensive at 6:22 by not attacking the vanguard, in reality both cardfighters had seen Dorint and Blaster Dark Revenger in his drive checks on the previous turn--hence avoiding sending him to that damage line would have only resulted in Dorint unflipping a damage to enable a restand regardless. Touya had previously placed fourth in the Fair's minor tournament on the preceding day, while his opponent from the finals placed first. In the following tournament on the 7th, he captained Team Delta Attack in winning the team tournament; but due to poor promotion, very few cardfighters knew of the team tournament and only three teams competed. Following this, at the ARG state championship on June 20th, his teammate Alexander Wilson made top 8 playing a Megacolony Machining deck, and Touya himself placed in the top 16 with an “Abyss”-Phantom Blaster Dragon deck using legend deck support. Both fighters are currently qualified for the ARG national championships in August, as each of them has acquired the 20 points necessary to enter the nationals. His Revenger deck listed below is primarily designed to optimize the number of triggers checked per game, rather than going for a single game-ending attack by breakriding over Mordred. From Touya's perspective, the primary value of Mordred was of baiting the opponent into leaving him at three damage, after which he would normal ride into “Abyss” and use his legion to stretch out a vast difference in damage between himself and his opponent. Being free to absorb attacks at that point in the fight while his opponent was forced to guard, this would cultivate a difference in available shield that would eventually leave them unable to guard. The more one attacks with “Abyss” in the deck, the deeper they can filter for its combo pieces to enable additional attacks later on. 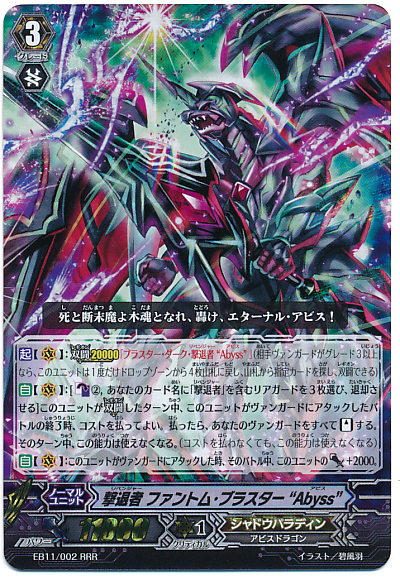 Readers should be aware that an ideal version of the deck would use four copies of Dark Revenger, not three--the deck's author dragged his heels in picking up Revenger perfect defense cards, both out of spite and in the knowledge that the upcoming Sovereign Star Dragon support nearly outmodes Dark Revenger.